About a month ago I was preparing to attend a painting event in Crystal City where you create your own painting. After much consideration, I decided that the work of art I was going to create that night was a clock. No real reason why, I just was inspired to paint a clock. So, armed with a concept, I then turned to my favorite site, Pinterest, for further inspiration. I saw a design that I felt described me perfectly. I actually chuckled out loud because I knew that if I painted this and hanged it in my home, any and every one that saw it would immediately nod in agreement, knowing that this fit me perfectly. 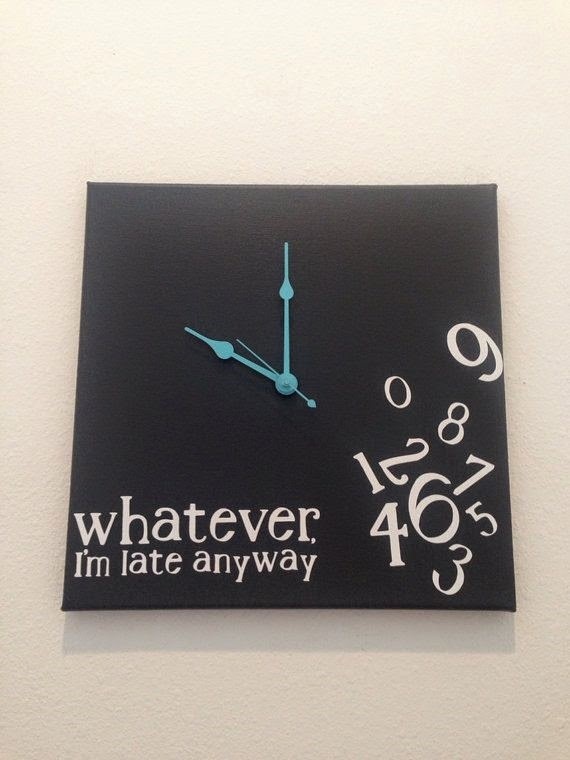 I am late EVERY place I go. Doesn’t matter how far in advance I start nor how close the destination, I am always late. This is something that I’ve been mindful of and tried to work on from time to time for years. Yet, I still struggle with arriving early to events. Refusing not to further promote this vice, I opted not to use this design but instead did an abstract depiction of a clock instead. But I do recognize that punctuality is a character trait that I should exhibit. In the book “Marriage A to Z”, Carolyn Tatem discusses the importance of this as part of the “On Time” principle. She states that we miss out on important experiences by being late. Also, the way you practice this character trait (being consistently punctual or being consistently late) communicates a lot about you as an individual for singles and as a couple for married people. This makes perfect sense because our thoughts translate into behavior and behavior into character. Therefore, my lack of discipline in being timely really tells people a lot about who I am as an individual. I don’t want to be known as an undisciplined individual. Additionally, since in a marriage relationship we are one, I don’t want my character flaws to reflect badly on my husband. In my season of singleness, what do I need to do to develop in this area? · Poor Planning: I tend not to consider everything that must be accomplished in order to get somewhere on time and allocate time properly. · Over-commitment: Being involved in many different things, I commit to doing things and conflicts arise. Because I don’t want to renege on a commitment I’ll then book events back to back which causes me to be in a constant state of rushing from one place to the next and typically arriving late and leaving early. · Procrastination: Consistently I’ll wait until the last minute to pick out my clothes, make/eat my meal, gather the necessary materials, etc. This results in rushing to complete the task and often re-work. · Laziness: I tend to sleep/nap before I have to leave the house. When the alarm goes off, I stay in bed a few minutes longer and then have to rush to get ready. Reflecting upon what to do with this information, I found some helpful tips and strategies onCharacter-in-Action’s website (http://character-in-action.com/punctuality-tips-and-strategies/). I am now purposing to deliberately practice them. (I’ve already accomplished the first!) It will require reframing my perspective and anchoring these actions in a scriptural foundation. The tips and strategies along with the scripture references that I’ve identified are going to guide my development in this area. No matter the state of my love life- single, courting or married, I desire to be an accurate reflection of God and live a life consistent with His word. Thus, I must work on being on time, knowing that His grace will sustain and assist me as I develop in this area of my life.